Motherwell manager Stephen Robinson has revealed that midfield sensation David Turnbull wants to sign a new contract with his boyhood heroes. 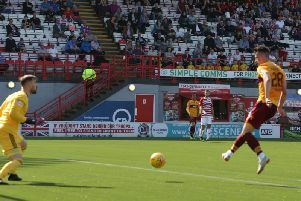 Turnbull (19) has come through the ranks with the Steelmen since first joining the club aged nine and has scored a total of three times in recent wins over St Mirren, Dundee and Aberdeen. “David’s a young boy,” Robinson said. “He wants to sign for the football club but whether his representatives believe that’s the right thing to do, I’m not so sure. “What we try to do is let him concentrate on his football. Meanwhile, Robinson said that injury hit defender Charles Dunne won’t be risked against Celtic tomorrow (Wednesday) despite coming through one half of the reserves’ 6-1 win over St Johnstone on Monday. Robbo said: “Possibly it’s a little bit soon for Charles, he’s been out for nearly three months. “He played 45 minutes. It wasn’t too testing a game for him. He came through it unscathed. “We’ll have a look at it but I think it’s probably a few days too early for him. Robinson said that this week the players had been shown videos of their respective performances in the 3-0 win over Aberdeen on November 24 and the 2-0 defeat at Livingston on Saturday. He added: “We didn’t do the free stuff well enough against Livingston that we’re renowned for. “We’ve been up and down this season, we’ve lacked a consistency.